Despite widespread coverage of the growth in the food export market in these difficult economic times, the challenges for indigenous food producers are higher than ever in domestic terms. Recent research conducted by Bord Bia titled “Retail Markets Today and Tomorrow” predicts these challenges to continue with the growing convergence of the Irish and UK retail markets. Tesco (Irelands largest multiple in market share terms) are looking to synergise their product offerings across both Ireland and the UK. This in its own right is putting pressure on Irish Foods and Drink producers to get listings for their products in order to tap into the larger UK market. However, the inverse effect is that it intensifies the risk of being cut out of the domestic market. This has a benefit for consumers with an ever increasing range and variety of products available to them in the supermarket, and coincides with a growth in the number of acceptable brands in their purchase repertories in recent years. From a local producers perspective however, the availability of new brands, the increased weight of specific Supermarket and Discounter Private Label alternatives and the prevalence of numerous high value based promotions on shelf makes it abundantly clear to see the difficulties faced by even our most traditional and loved Irish food brands. We acknowledge that fresh growth can be achieved through innovating and differentiating our brands, but this is often a risky ploy given the level of investment and commitment required. 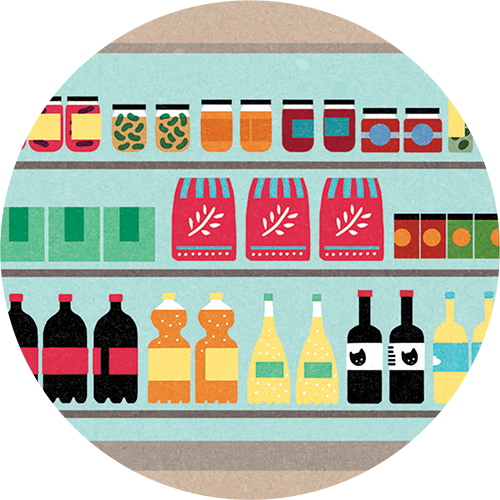 All too often new products are launched on the supermarket shelf with little or no impact. Many of these new products are created based on the ability of current machinery to accommodate them and not on what actually may excite consumers or tap into a specific consumer need or benefit. Let’s take the Pre-packed Sliced Cooked Meats category you see in your local supermarket. In the past number of years consumers have begun to question their traditional brand loyalties, all the while brands continue to haggle with retailers to maintain their position and visibility on shelf. Between 2008 and 2011 the sliced meats market had dropped 5% in overall value terms, so for the key branded players, something had to give. Step in Denny (part of the Kerry Foods portfolio) who knew they had the ability to re-invigorate the category through leveraging known consumer product concerns with the introduction of “Denny Deli Style 100% Natural Ingredients Ham”. “We knew that the chilled aisle had become a battlefield for special offers and price promotions with consumers trying new alternatives to old favourites” agrees Nicola Weldon, Market Manager with Kerry Foods. “But given the confidence we had with the Denny brand, we wanted to show consumers that they are making a smarter choice with the 100% Natural Ingredients range and are ensuring the best is going into their children’s lunchboxes”. Denny utilized OI Research’s Ideator approach to evaluate the likely performance of the concept against current portfolio and competitor offerings. Ideator TM has helped a large number of OI Research clients both in Ireland and abroad identify realistic NPD opportunities with robust numbers to support decisions for forecasting purpose, securing CAPEX, aid marketing communications and identify new consumer targets. And the results certainly provided the level of insight and confidence needed by the Denny team. It predicted a higher level of purchase than the current range including a new profile of buyers coming into the brand. It did not however alienate the current customer base and found they were even more delighted with the product. The research also provided clarity around the new aspects of the brand that resonated with buyers as well as providing clues to the level of cannibalisation that will occur once launched. It identified a number of additional usage occasions for the product and importantly provided direction as to optimal pricing strategy. “The results from Ideator reinforced the potential of Deli Style 100% Natural Range and helped uncover potential new areas for our brand to tap into. So much so that we have adopted the Ideator approach across our category portfolio for NPD purposes” reports Weldon. To enhance this early indication of success, Denny launched a multi-media campaign around the 100% Natural ham range to change the modern inertia of category buyers around this news. The campaign prompts consumers to take a closer look at Denny’s ham, showing them Denny Deli Style is the only ham made with 100% Natural Ingredients. It consisted of TV, Radio and Cinema commercials, mass outdoor at point of sale and mainstream outdoor formats including digital. Early indicators of launch success were witnessed with significant volume increase coupled with strong penetration growth. Rarely have brands within such mainstream food categories achieved success of this nature with new product launches. It is testament to the team at Kerry Foods, given successes like this don’t just happen over night. And so may this success continue for Denny and show other Irish food producers that early testing of innovation ideas can help predict success and save money. Natural focus – naturally innovative!